Note: The following is modified from Steve Bissette's introduction to the new collection of the comic book PALEO by Jim Lawson. 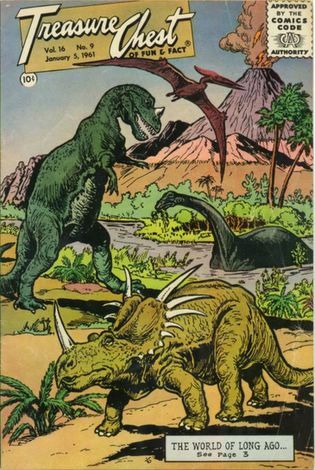 The next significant landmark dinosaur comic emerged in 1959 from a rather unlikely source; and it becomes, somewhat, part of my own story. 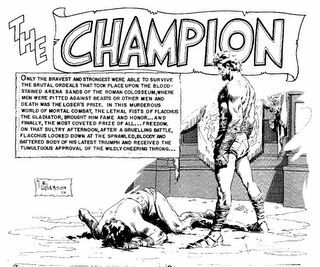 For two decades, Gilberton Publications had built their publishing empire entirely upon comic book adaptations of classic literature: the venerable and celebrated Classics Illustrated series. 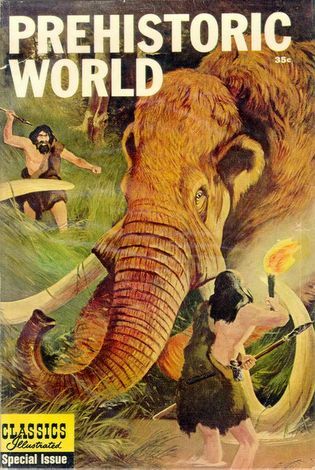 By the late 1950s, Gilberton had diversified, enhancing its line with the fairy-tale fueled CLASSICS ILLUSTRATED JUNIOR adaptations, and the encyclopediac THE WORLD AROUND US which offered “a World of Adventure, Travel & History” to more studious comic book readers. This monthly educational series offered 72-page squarebound overviews on a variety of subjects, from military histories (THE ILLUSTRATED STORY OF THE MARINES; THE COAST GUARD; etc.) and animals (THE ILLUSTRATED STORY OF HORSES; DOGS; etc.) to more esoteric fare (THE ILLUSTRATED STORY OF PIRATES; GHOSTS; MAGIC; etc.). 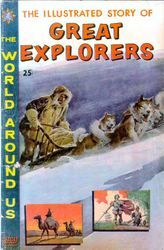 I was a mere lad of four years when the cover of the November, 1959 issue of THE WORLD AROUND US #15 leaped off the comic book racks at Towne’s Market in Essex Junction, Vermont. Beneath the bright yellow masthead THE ILLUSTRATED STORY OF PREHISTORIC ANIMALS was a vivid painting (signed by one Geoffrey Biggs, or Bigge) of a Tyrannosaurus rex and a Triceratops locked in mortal combat as twin volcanoes erupted in the background. 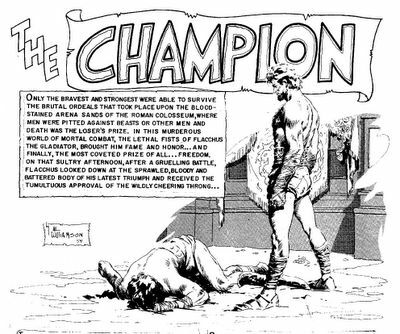 It was the first comic I recall wanting; my dear mother obliged, and my life forever changed. This new artifact was a thing of beauty to me (and, in hindsight, it still is). Dinosaur children’s books had been a fixture of my existence, but this was something new, and somehow more vital, more alive, than the most beloved of all my dino books. I poured over its pages, brooded over its single most glaring error (the coelacanth in the very first story, “The Fish That Never Died,” was erroneously drawn as an icthyosaur -- my, how that bothered me), labored over my own crude copies of the art in my favorite panels, read and reread the comic, as best as I could read at age four. 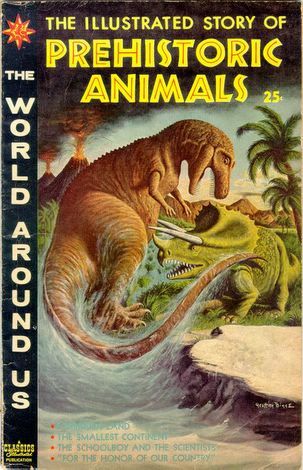 I wore out my first copy so quickly that mom still had time to buy a replacement copy off the newsstand, and was sorely disappointed when the next issue of THE WORLD AROUND US wasn’t dedicated to more prehistoric material -- it was (choke!) 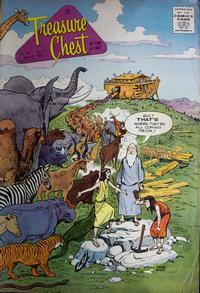 THE ILLUSTRATED STORY OF THE CRUSADES -- leaving me to make due with TUROK as usual. 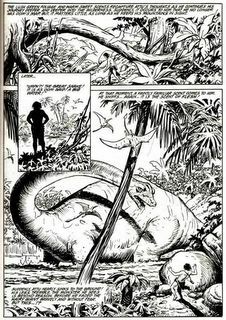 Art by Al Williamson (C) EC Comics. 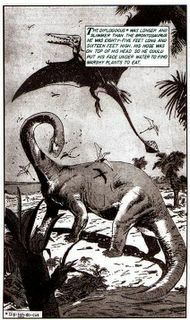 But most mesmerizing of all were Sam Glanzman’s pages, illustrating the eight-page “Giants in the Earth.” Though there was little sequential intensity to the piece -- composed, essentially, of unconnected single-page splashes depicting the ‘star’ dinosaurs circa 1959 pop science, many of which were (apparent even to my encyclopedia-trained four-year-old eyes) clearly drawn from Charles Knight’s paintings -- it was Glanzman’s drawing and inking style that I found riveting. Sam dared to be ‘messy’: his jungles and saurians were fly-blown and gritty, stray drops of water, slaver, and shreds of vegetation dropped away from his dinosaurs, unidentifiable bits of matter spun or hung in the air, as if suspended or moved by the heat and humidity. I’d been around enough barnyards, ponds, and forests to know nature was as ‘messy’ as Glanzman’s tableaus, which I quickly loved as I’d loved no drawings before. Glanzman eschewed the neat sterility of most natural history and paleontology art, and seemed more tactile, more alive, than any art I’d ever laid eyes on before. His mere eight pages of comic art blew away every recreation of dinosaur life I’d ever seen before, and I was hooked. From that day on, I had a tyrannosaur on my back. I was a dinosaur comic junkie in need of a fix -- of which there were precious few. Art from "Attu" (C) Sam Glanzman. Almost three years later, Gilberton and CLASSICS ILLUSTRATED obliged with a giant “Special Issue,” PREHISTORIC WORLD (July, 1962). Though it was a fine comic indeed, featuring at least one innovative bit of sequential experimentation (the three-pager “The Wonderful Earth Movie,” presenting tiny panels illustrating an imaginary one-year-long movie about the history of life on Earth, offering a humbling, mind-boggling perspective on how fleeting man’s cameo in that history is) and lots of dinosaurs, it didn’t have anything approaching those pages by Sam Glanzman, and thus never assumed the mythic stature of that first CLASSICS ILLUSTRATED dinosaur comic. Read more of Steve's thought's about Sam Glanzman HERE. Next Week: Part 7 - Gorgo's Mash O' Monsters. Read Part 5 of the series by clicking HERE. All art and properties are (C) their creators and/or current copyright holders. 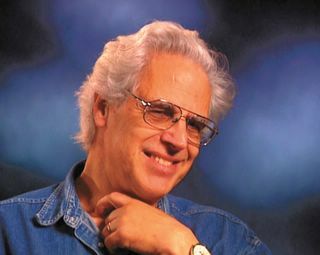 Steve R. Bissette is an artist, writer and film historian who lives in Vermont. He is noted for, amongst many things, his long run as illustrator of SWAMP THING for DC Comics in the 1980's and for self-publishing the acclaimed horror anthology TABOO and a 'real' dinosaur comic TYRANT(R).